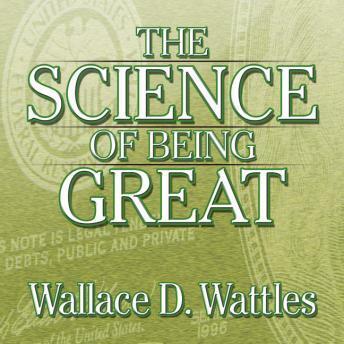 The Science of Being Great is truly a treasure...a personal-growth classic. Wallace D. Wattles' final word in self mastery has a powerful message that will be of value to every person who seeks true fulfillment and the awakening of his or her highest potential. A companion work to Wattles' other classic, The Science of Getting Rich, this audiobook is a summary of the knowledge that the author culled after studying the wisdom of the world's religious leaders and great philosophers. Here he argues that the power of thought and positive self-esteem is the only true measure of a man's greatness. This audiobook is for everyone, young and old, who wants to make the most of life, by making the most of themselves. It is a timeless lesson in personal power.